There’s a long history of oh so witty, aren’t-we-clever literary couples. A few standouts spring to mind: Beatrice and Benedick (“Much Ado About Nothing,” Shakespeare, 1612); Elyot and Amanda (“Private Lives,” Noël Coward, 1930); Nick and Nora (“The Thin Man,” Dashiell Hammett, 1934); George and Martha (“Who’s Afraid of Virginia Woolf,” Edward Albee, 1962). In 2010, playwright Douglas Carter Beane though he’d try to join this auspicious coterie. He took his title from a song by Cole Porter (another deft, droll wordsmith): “Mr. & Mrs. Fitch.” He even has Mr. Fitch sing the song in toto, as an intermezzo from the barrage of badinage and arcane literary references. Right off the bat, as they enter their chichi 2,000-square-foot Manhattan loft, exhausted from another round of stultifying social events, they call each other “Dearest” and “Darling” (as well as “Mr. Fitch” and “Mrs. Fitch.” We never do learn their actual names). She’s all over him, fairly begging for a late-night tryst, but he couldn’t be less interested. Turns out, he’s always preferred men — though he can be cajoled (with help from the “little blue pill”) into indulging his wife periodically. One thing they do create together is a snarky, acidic, Walter Winchell-style newspaper gossip column. The comparison is used advisedly; almost all the references to actual (non-literary) people are from way, way in the past, though the play’s setting is supposed to be the present. (Maury Amsterdam? Really? And his “Big Book of Jew Jokes?” Ugh). The Mrs. comes up with most of the ideas, but she’s convinced (by him?) that she has no imagination, can’t write, and only he can use words “brilliantly.” She’s pushing him to write the novel he began years ago: “America: A Prophecy” (her title suggestion). But now, in the age of social media, they feel old, desperate, and verging on obsolete. And their boss is demanding a “humdinger” to finish their current column. What’s better than inventing gossip? Inventing a fictional celebrity. The internet explodes with the story. When they start imagining an X-life for the new hottie (sexual encounters with a person of unnamed gender), they lose control of the narrative altogether. “There are two sides to every story,” they tell us. “The truth and what the rich say to hold onto their money.” Now that’s something we can relate to — a lot more than the smug repartee. After that litany of all the flaws and weaknesses of the play, it must be said that the portrayals are simply splendid. Sandy Campbell and Andrew Oswald make a delightful couple. She’s done comedy before, but he’s better known locally for more serious, deeply toubled characters. Together, they have credible chemistry and crackerjack timing. And they really seem to be having fun. Director and Backyard Renaissance co-founder Francis Gercke keeps the pace lively. 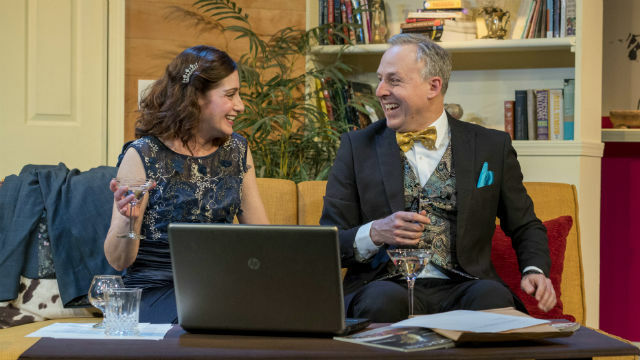 Campbell gets to wear some stunning outfits (costumes by Jessica John Gercke) and inhabit, for a while, a spiffy, high-end apartment (designed by Tony Cocuzzella). The sofa doesn’t quite live up to the couple’s pretensions; but the brick kitchen and skylight are inspired. You may be amused (and perhaps as self-satisfied as the characters) at catching all the in-jokes and esoteric allusions. If that’s not your thing, you’ll certainly enjoy the company of two expert actors at the top of their comic game.